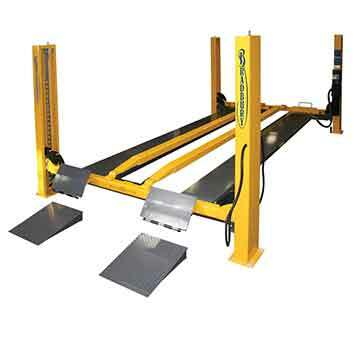 The H4443 by Bradbury is a 4 post wheel free car hoist. It is one of a kind and is highly versatile! This patented product, which has been around for decades, is almost like having two hoists in one. The wheel free beams, which slide laterally along the cross beam to jack the vehicle up, lift in conjunction with the platforms which can then be lowered whilst the vehicle remains in place in the air on these wheel free beams! The specially designed vehicle parking system is fully automatic and managed entirely by the control box.